The digital image (I love this picture and probably won't change it unless we have a better Ultra in the future - here's hoping!) above was taken during our longest offshore trip (twenty-four hours) called the ultra marathon. This one, on July 19, 2005, was one of the more enjoyable Ultras. But it will be most remembered by the number of large cod that were caught on the trip. Also, the weather was perfect with a clam ocean all day.. Some of the best anglers I have ever known appear in the shot above. 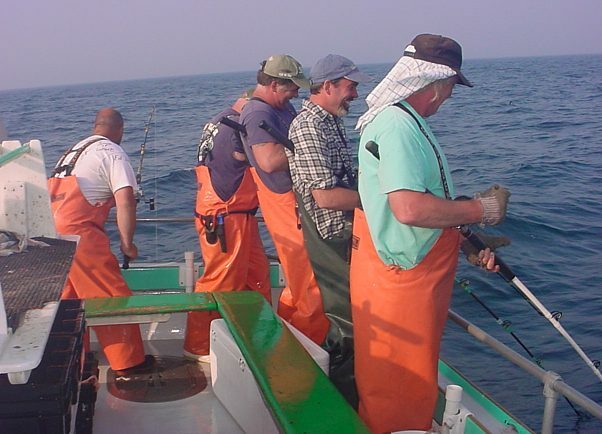 From right to left are Bob Withee (NH), to his left is Don Johnson (MA), Jim Feeney (MA) appears next to Don, Fred Kunz (NH) has the blue knife on his belt in the corner and Tim Williams (CT) has just hooked into a big one on the stern. All these anglers are hooked up to cod in the 30 pound range (more or less). It was the one time this year that I had the camera ready at the right time. The Ultra is much like our other marathons with slightly less anglers and almost a full twenty-four hour day on the water. Tickets for the Ultra are by invitation only. Note: Note: Reservations for the 2018 season will be commencing on February 1, 2018 at 5:00 AM local time or 0500 EST. Reservations will not be accepted "in person", "email" or "by letter" until February 2, 2018. Ticket prices remain the same as they were last season. We reserve the right to add a fuel surcharge during the 2018 season if prices escalate to unreasonable values. FULL DAY FISHING TRIPS - 7:00 A.M. to 3 P.M. - $90.00/person(Max 30 passengers). HALF DAY FISHING TRIPS - 4 P.M. to 8 P.M. - $50.00/person(Max.30 passengers). ***Note: Sunday, May 13th (Mother's Day) is scheduled as a charter only. We will not sail on this trip unless a charter has booked the boat for that day. ARRIVAL TIME: Please arrive 1 hour before departure to secure your reservation. MARATHON FISHING TRIPS** - 5 A.M. to 5 P.M. - $175.00 per person (Max. 18 passengers). We are running 43 scheduled marathon trips this season. It is mandatory to call about departure times the day before your trip leaves. If you do not call you could be left on the dock if we leave earlier and you aren't there to leave with the boat. This has happened in the past. There are no refunds for missing the boat. If the weather is good and the fishing is better further offshore, we leave earlier (between 3 AM and 4 AM) in order to take advantage of calmer seas and faster cruising speeds. Note: As has been scheduled from the 2014 season, the marathon trip is an event that takes place on Tuesdays & Thursdays, normally. However, in previous years, most of our marathon trip charters occurred on Monday & Friday during the week. This will be available in 2018 as well, the two days normally reserved for extreme day trips. The differences include: a. This is a charter only situation. b. The date has to be free of any extreme day reservations. c. This is available every month except for July & August. d. Tim will not be the captain on this trip. FULL DAY FISHING TRIPS - 7 A.M. to 3 P.M. - $2,700.00 minimum for 1 to 30 anglers. 1. Persons must be at the dock 1 hour before departure. 2. Very large and/or empty coolers are to be left ashore. 3. Persons are required to reconfirm between 11 AM and 6 PM (at the latest) the day before departure to determine the possibility of cancellation for bad weather and actual departure time. Depature time may vary 2 hours from schedule. 4. Full rain gear and waterproof boots are required on April, May, October & November trips. Full rain gear is always suggested & a very good thing to have on a marathon trip. * Dates on which Ian Keniston is scheduled to be running the trip as captain. **Dates on which Tim Tower is scheduled to be running the trip as captain. Tim is scheduled to run all the marathon trips this year, as other years, unless a Monday or Friday extreme day trip has been chartered as a marathon trip. *** Mother's Day. This trip is charter only. The Bunny Clark does not leave the dock this day unless it is booked as a charter.